Belgium and Luxembourg still think of Central Asia as a largely unknown and distant region, which is only marginally important to their foreign policy interests. Still, today both countries are more interested in Central Asia than they were fifteen years ago, when bilateral contacts were first established. Similarly to several other European Union (EU) member states, especially smaller countries, bilateral relations are mostly limited to economic diplomacy, aimed at securing new trade and investment opportunities. Most other concerns, such as security, energy, democracy and governance issues, are delegated to the EU. Because of its relative economic wealth and more developed administrative capacity, Kazakhstan is considered the most attractive Central Asian partner. In the past few years, Belgium in particular has increased its efforts towards enhancing economic ties with Kazakhstan. However, trade and investment remain underdeveloped and only involve a handful of companies. 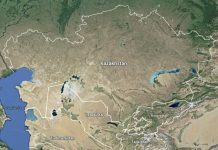 Despite Belgium’s relative disinterest in the region, all five Central Asian republics are eager to enhance ties with Europe’s capital country. Belgium is the host country of the main executive and legislative EU institutions, as well as the headquarters of NATO. Thus, it receives a great deal of political attention from Central Asian leaders, who are keen to meet with Belgian officials during their visits to Brussels. All Central Asian states have opened an embassy in Brussels. Belgium and Luxembourg both established diplomatic relations with the Central Asian states in 1992. The first official Belgian visit to Central Asia took place six years later, when then Prime Minister Jean- Luc Dehaene travelled to Kazakhstan and Uzbekistan to promote bilateral relations. The visit also intended to smooth out tensions between Belgian utilities company Tractebel and the Kazakh government. In 1997 Tractebel had secured a 20-year concession to operate and modernise Kazakhstan’s western and southern gas distribution systems. But the company had come under fire in Kazakhstan over allegations of bribery. 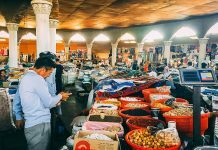 As trade and investment opportunities increased, the visit also served to conclude bilateral agreements between Belgium and Kazakhstan and Uzbekistan on mutual investment protection and avoidance of dual taxation. Nearly a decade passed before another high-level meeting took place between Belgian and Central Asian leaders. The long silence was in large part due to the catastrophic Kazakh adventure of Tractebel, which came to an abrupt end in 2000 when the company sold all its assets in Kazakhstan to state gas pipeline operator Kaztransgaz after suffering huge financial losses and coming under suspicion of fraud. It was only in 2006 that the Belgian state fully recovered from the debacle, notably when it decided to establish an embassy in Kazakhstan. The decision to open an embassy in Astana was made in light of the region’s growing geostrategic importance, as well as Kazakhstan’s increased potential for trade. It also coincided with Belgium’s chairmanship of the Organisation for Security and Cooperation in Europe (OSCE), which had singled out Central Asia as one of its 15 priorities. During his visit to the region in March 2006, OSCE chairman-in-office Karel De Gucht called upon the Central Asian leaders, including Turkmen dictator Saparmurat Niyazov, to implement political reforms. In Uzbekistan, relations with the OSCE were at a low following the international community’s condemnation of the Andijan massacre. There, De Gucht talked about the state and the prospect of relations between Uzbekistan and the OSCE, and raised concerns over reports of growing pressure on non-governmental organisations. In December 2007, De Gucht returned to Turkmenistan as Belgian minister of foreign affairs, this time accompanied by a group of Belgian businessmen eager to explore the commercial opportunities generated by the country’s opening up in the wake of Niyazov’s death. The trade mission followed a meeting in Brussels a month earlier between the new Turkmen president, Gurbanguly Berdymukhamedov, and Belgian Prime Minister Guy Verhofstadt during the Turkmen leader’s first official visit to the EU and NATO. A few months after De Gucht’s return from Turkmenistan, he received a Turkmen ministerial delegation in Brussels, who wanted to sign a Memorandum of Understanding to form the basis for future cooperation with Belgium. Belgium also maintains parliamentary contacts with the region, particularly within the framework of the Inter-Parliamentary Union (IPU). The Belgian IPU section has established bilateral friendship groups with Kazakhstan, Kyrgyzstan, Tajikistan and Uzbekistan. Through these groups, three kinds of inter- parliamentary activities are held. Meetings are organised at the Belgian parliament, mostly with ministers of the different countries of the region, usually when they are in Brussels for meetings at the EU institutions. Contacts are made with the countries’ embassies to Belgium in Brussels. And Belgian parliamentary delegations visit the region. Like Belgium, Luxembourg has maintained bilateral relations with the Central Asian states since 1992. However, diplomatic contacts were for a long time low-key. Luxembourg has stepped up its bilateral relations with the region only in the last five years in the hope of enhancing cooperation, especially in the economic and financial fields. To this end, a series of high-level visits to the region were organised, kicked off by an economic mission to Astana in June 2008 headed by Prime Minister Jean-Claude Juncker. During this mission, Luxembourg offered to help train Kazakhstani financiers and bankers. The next high-level trip to the region was made by Foreign Minister Jean Asselborn in March 2010, when he visited all five Central Asian states. Afterwards, a series of bilateral contacts took place in 2010 and 2011 between the Kazakh ambassador to Luxembourg, who is based in Brussels, and Luxembourg officials and politicians. The two sides expressed interest in cooperating on financial monitoring, transport, metallurgy and satellite navigation. In addition, they decided to establish a business council and to enhance coordination between Luxemburg’s financial institutions and the corresponding organisations and structures in Kazakhstan, through the Luxembourg for Finance agency and the Association of the Luxembourg Fund Industry. The Kazakh ambassador also met with the chairman of the ‘Luxembourg-Kazakhstan’ inter-parliamentary friendship group, who called for strengthening cooperation between the legislative bodies of the two states. Most of these plans were sealed by a number of bilateral memoranda signed during the Kazakh prime minister’s visit to Luxembourg in May 2012. In December 2011, Tajik President Emomali Rahmon visited Luxembourg on the margins of his meeting at the European Investment Bank. The two sides adopted a joint declaration to strengthen bilateral relations. Luxembourg does not have an embassy in the region and the Netherlands represents its interests in the countries where it has not yet accredited an ambassador. Bilateral trade between Belgium and the Central Asian states is very limited (see the tables below). Trade volumes remain minimal even with Kazakhstan, the region’s most attractive and economically-advanced country. However, there has been an increase in trade with Kazakhstan in recent years. Belgian exports increased by 40.15 per cent in 2010 amounting to €100 million, and grew again by 18.31 per cent in 2011 reaching a total of €118 million. Belgian services exports to Kazakhstan have seen even more significant increases over the last few years, rising from €940,000 in 2002 to over €64 million in 2011. The main sectors include transport and logistics, communications and construction. Despite the steady increase however, in 2011 Kazakhstan still only ranked 81st in Belgium’s export markets. Belgium’s exports to Kazakhstan by far outweigh its exports to the other four Central Asian states, and have relatively diversified over time. Nonetheless, they still follow the same pattern of Belgian exports to all five countries: they are mainly in the hands of a few Belgian companies and are dominated by only a few types of products. In addition, they often involve one- time contracts. The main export products are machinery and mechanical appliances, pharmaceutical and chemical products, optical instruments and plastics and plastic products. Belgian imports from the Central Asian countries are very limited. They consist almost entirely of cotton and hydrocarbon and hydrocarbon products. While Belgium purchases cotton from the region on a regular basis, the import of hydrocarbons is in constant flux. As a result, Belgian imports from Kazakhstan, in particular, rise and fall quite steeply depending on whether oil and oil-related products were imported or not. In contrast, Belgian imports from Tajikistan have been relatively stable, because they consist almost exclusively of cotton. Belgium’s main cotton supplier in the region is Uzbekistan, despite the continued use of child and forced labour in the Uzbek cotton industry. Belgium is a minimal player in foreign direct investment (FDI) in Central Asia, especially compared to its neighbours and main commercial competitors, the Netherlands, the UK, France and Germany, which are among the largest investors in the region. Unlike these four EU member states, Belgium is no longer an investor in Central Asia’s energy market. Belgium’s limited investment profile is also due to the risk-averse attitude of Belgian business entrepreneurs, as well as the fact that Belgium’s economy is dominated by small and medium enterprises (SMEs). Belgian investors in Central Asia include Enex Process Engineering and Sarens. The latter is an international leader in heavy lifting and engineered transport, which has a branch in Atyrau, Kazakhstan. Enex Process Engineering is an important player in Turkmenistan, where it develops large-scale investment projects in the upstream, midstream and downstream sectors of the gas industry. The company’s CEO, Belgian businessman Koen Minne, has close ties with President Berdymukhamedov and has been appointed Honorary Consul of Turkmenistan to Belgium. Alongside economic diplomacy at the government and state level, bilateral economic contacts have been established at lower levels. The Chamber of Commerce of the Province of Antwerp, for instance, has launched a project with counterpart organisations from Central Asia. The project is aimed at facilitating cooperation between Belgian and Central Asian companies, through, among other things, participation in a Virtual Business Platform. This is part of a broader initiative to promote the province of Antwerp as a ‘Gateway to Europe’ and to attract Central Asian companies that might want to enter the EU market through the port of Antwerp. Another recent project is the ‘Flax Route’, launched by Flemish entrepreneurs inspired by the idea that the flax trade route of Flanders symbolically intertwines with the Silk Road. The goal is to establish and maintain a network of contacts in Central Asia, advocating for and supporting the development of overland trade routes that might be of benefit to the business community in Flanders and the Benelux. 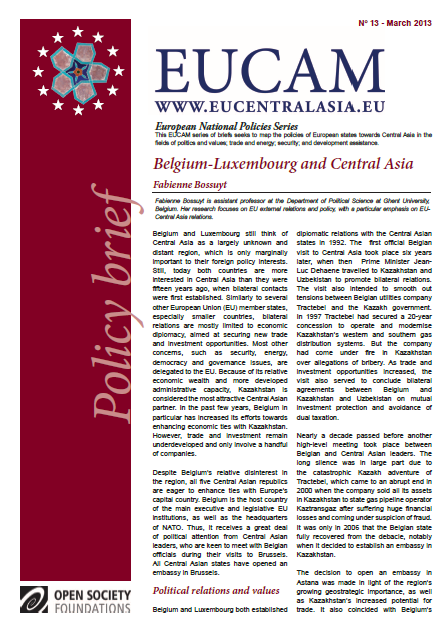 Luxembourg’s trade relations with Central Asia are extremely limited. Exports to Kazakhstan came to only €3.3 million in the first ten months of 2012. This represented a considerable decrease in comparison to 2011, which totalled €7 million, and even more so compared to 2010, when exports amounted to €13.8 million. (3) In the first ten months of 2012, Luxembourg’s exports to the other four Central Asian republics amounted to €2 million for Uzbekistan and for Turkmenistan, €585,000 for Tajikistan and €208,000 for Kyrgyzstan. The country’s main export products to Central Asia are machinery, mechanical appliances, electrical equipment, base metals, rubber and plastics. Imports from the region to Luxembourg are negligible and sometimes even zero. Luxembourg’s investment in Central Asia is slightly more significant, compared to the tiny trade volume. This is mostly because of Luxembourg’s activities in the financial sector, especially in Kazakhstan and Uzbekistan. According to the National Bank of Kazakhstan, Luxembourg’s investments in the Kazakh economy stood at €18.9 million in 2011. Luxembourg contributed €100,000 to the training of border control officers in 2009 as part of the OSCE’s work on controlling the Afghan-Tajik border. (5) Overall, in the security sphere, both Belgium and Luxembourg are only marginally involved in the region. Their engagement has been for the most part indirect, mostly expressed through their support to the Central Asian security missions and programmes of NATO, the EU and the OSCE. Luxembourg also provides bilateral assistance to the region. It is financing the training of experts to support the modernisation of the banking and financial sectors of Kazakhstan and Uzbekistan. (7) While Luxembourg has been offering this kind of support to Uzbekistan since 2002, the assistance now forms part of Luxembourg’s contribution to the implementation of the EU’s 2007 Central Asia strategy. All five Central Asian states are among the 18 beneficiary countries of a multi-annual project by the Institut d’Immunologie du Laboratoire National de la Santé à Luxembourg (LNS), which is being implemented within the framework of a World Health Organisation (WHO) project. Luxembourg also supports two non-governmental organisations (NGOs) working in the region: SOS Villages d’Enfants, which received €696,092 for 2010-2012 to support two projects on education and basic social services in Uzbekistan, and Caritas Luxembourg, which was given €688,000 for 2012-2015 to implement medical services projects in Tajikistan. 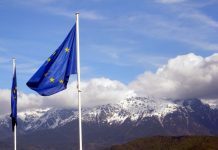 The Belgian government offers limited or no direct support for the implementation of the EU’s 2007 Central Asia strategy. One exception is the involvement of Belgian civil servants in the ‘Regulations for Competitiveness’ project in Kazakhstan. Co-financed by the OECD and the EU, this project aims to enhance Kazakhstan’s private sector competitiveness through strengthening regulations and institutions. As part of the project, a seminar was organised in Kazakhstan in July 2012, during which Belgian civil servants shared their expertise in training and recruiting senior and mid-level civil service executives. 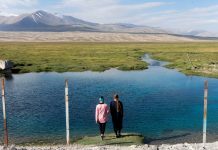 While Belgian official involvement in EU projects in Central Asia is negligible, several Belgian societal actors have been involved in the implementation of EU assistance programmes in the region. A number of Belgian universities and colleges, for instance, participate in Erasmus Mundus and Tempus. 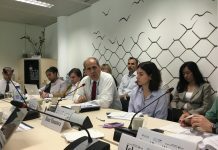 The Free University of Brussels and the Brussels Erasmus College contribute to the Tempus Project, Central Asian Network on Quality Assurance and Accreditation (CANQA), which runs in Kazakhstan, Tajikistan and Kyrgyzstan. 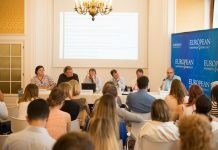 The Belgian college Lessius Mechelen is involved in the Erasmus Mundus project Mobility Academic Network between EU and Central Asia (MANECA), which provides mobility scholarships for students and staff from the five Central Asian countries. A team of Belgian organisations is running the multi-annual EU project ACCESS (Assistance in Clean Coal and Environmentally Sound Storage Solutions). The project team consists of four Belgian organisations and companies: Hasselt University, University of Liège, the Geological Survey of Belgium and Ecorem. Each organisation specialises in specific themes regarding Clean Coal Technologies and the identification of Carbon Capture and Storage. ACCESS contributes to the implementation of the EU-Kazakhstan Memorandum of Understanding on energy cooperation, which was signed in 2006 with the aim of improving the sustainable development of the energy sector in Kazakhstan. 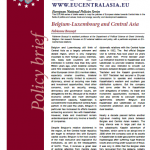 Belgium and Luxembourg do not feel closely connected to the Central Asian states, which they still approach as relatively unknown countries located far beyond Western Europe. Belgian and Luxembourg’s involvement in the region is mostly driven by commercial interests. As a result, bilateral relations are limited to economic diplomacy, aimed at securing new trade and investment opportunities. 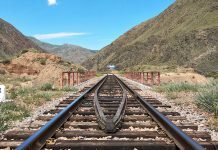 Despite recent efforts to promote economic cooperation, trade and investment relations are still very limited, even with Kazakhstan, the region’s most attractive country. Other concerns such as security, energy and governance-related issues are mostly delegated to the EU level. Both Belgium and Luxembourg fully support the EU’s 2007 Central Asia strategy, which, together with the activities of the OSCE, forms the basis of their political relations with, and priorities for, the region. In 2010, a cooperation agreement was signed between the Court of Audit of Belgium and the Kazakh Accounts Committee. Cooperation will be based on the exchange of analytical and methodological information on the implementation of financial control. The agreement also foresees cooperation on personnel training and retraining, and the institution of concurrent control and analytical activities, joint research programmes and seminars. Trade policy in Belgium is a competence of the Regional Authorities, that is, of the Flemish, the Walloon and the Brussels-Capital regions. Source: Ministry of Foreign Affairs of Luxembourg. Based on the answer provided in the Belgian Senate to a question raised by Senator Piet De Bruyn on 15 February 2012 regarding the financial assistance offered by the Ministry of Affairs in 2007-2011. See Belgian Senate, ‘Schriftelijke vraag nr. 5-5644 van Piet De Bruyn (N-VA) d.d. 15 februari 2012 aan de vice-eersteminister en minister van Buitenlandse Zaken, Buitenlandse Handel en Europese Zaken’, http:// www.senate.be/www/?MIval=/Vragen/SchriftelijkeVraag&LEG=5&NR=5644&LANG=nl. Belgian Federal Ministry of Foreign Affairs, DG Development, Belgische ODA 2007 – 2010: Statistisch Jaarboek, 2011.